Understanding What is Trenchless Plumbing? Trenchless plumbing is an innovative procedure that allows you to bypass the backhoe when you’re replacing or installing new plumbing. 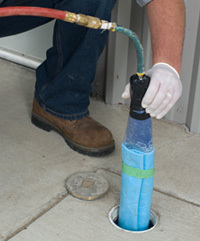 This type of plumbing requires little or no continuous trenches to be dug, and it is becoming one of the fastest-growing techniques in the engineering industry. Different types of construction methods are used than those that are used in traditional plumbing methods. For instance, methods that allow you to install pipelines under the ground with minimal excavation include ones such as tunneling, micro tunneling, directional boring, pipe ramming and other such methods. Several factors must be taken into consideration when installing trenchless construction, though. For instance, the state of the soil and its characteristics as well as the loads it will have to bear must be considered. The depth of the construction has to be deep enough that it won’t cave in when pressure is applied atop of it. In most cases, trenchless construction is a viable option, though. The most common type of trenchless pipe repair is integrated into existing plumbing through innovative methods such as thermoformed pipe, pipe bursting, slip lining, cured-in-place pipe, mechanical spot repair and various other methods. In these methods, the existing plumbing is utilized and either repaired or replaced via techniques that don’t require excavation. For instance, in slip lining and thermoformed piping, new liners are pulled into existing pipes and then heat or pressure is applied to the lining to make it expand to fill the pipe. The pipe bursting method, on the other hand, consists of bursting the old pipe from the inside and then forcing the fragments of the busted pipe outwards while a new pipe is being drawn through the holes to replace the previous pipe. Methods such as cured-in-place pipe and mechanical spot repair are primarily used for fixing spot leaks in certain locations. The process of integrating trenchless pipe repairs doesn’t consist of the major time, cost and damage to lawns and property that traditional excavation does. Although some strategically placed holes are drilled, the landscape is not disrupted like it is in traditional excavation methods. After digging the initial necessary holes, a cone-shaped bursting head is usually inserted into the old pipe, and it has the new pipe attached to the back of it. A steel cable works to hydraulically pull the cone-shaped bursting head and new pipe through the existing cavity. Because the old pipe is being fragmented and compressed into the soil around it as the new pipe is being pulled through, the new pipe is provided with perfect bedding. The pipes are essentially fused together to form one pipe that is root-proof, leak-proof and can even withstand earthquakes. This reason alone is enough for many homeowners to prefer trenchless repair methods to traditional ones, but it also results in less destruction to their property and less repair time since they won’t have to wait for the entire area to be dug up, fixed and then resurfaced again. Regardless of which method is used, it saves you time and money on your plumbing repair and installation. The actually process of bursting the old pipe and pulling the new pipe through it takes approximately an hour, but sometimes it might take longer. Because the landscape won’t be as affected as it would be with excavation methods, the restoration costs will likely be cheaper as well. To top it all off, trenchless plumbing is very durable is usually backed by lifetime warranties to provide you with peace of mind even in the most adverse elements. At Accurate Leak and Line, we’re experts with trenchless plumbing. Our team is licensed, expert trained, and quick to complete our jobs. Contact us today, to schedule your consultation!